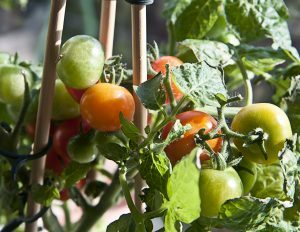 The How-to on Growing Tomatoes in Containers - Columbia Builders, Inc.
Sunlight is the number one factor to consider when deciding the best location to grow your tomato plants. When it comes to home gardens, tomatoes are one of the best plants to cultivate, especially since home-grown produce tastes better than store-bought! Even if you have limited space, tomatoes are within reach of any aspiring gardener. With the right-sized container and a sunny spot on your deck or patio, you can easily grow delicious tomatoes for salads and sauces. Here’s the how-to guide. Sunlight is the number one factor to consider when deciding the best location to grow your tomato plants. The plants will thrive and bear more fruit if they receive between six to eight hours of direct sunlight per day. And while there are more hours of daylight during the summertime, the path the sun travels can change the patterns of shadows on your deck or patio. Be sure to take this into account when assessing the placement of your plants. Since tomatoes grow on large vines, you’ll need to find a container that can hold enough soil to support them – in more general terms, bigger is better when it comes to the container! For the best results, you’ll want a container that can hold more then 18 inches of soil depth, or a total volume of 20 gallons or more. No matter the container style you choose, ensure that it has drainage holes drilled in before filling it with soil. The tomato plant thrives when it is planted deep within soil and is given plenty of support. Fill your container with high quality soil and other additions to enrich it, to about halfway deep. Place the seedling on the center, and fill in with more soil, ensuring that you leave two sets of leaves exposed, and water thoroughly. In addition, you’ll need to set up support stakes to encourage healthy growth with just about every tomato variety. Metal stakes are most common, though some homeowners use wood or bamboo instead. Place this support structure early so you don’t have to wrangle with a more mature plant later on! Check on your new transplants daily, water as needed and enjoy! This entry was posted on Friday, June 1st, 2018 at 10:56 am. Both comments and pings are currently closed.